Constable Fiona Russell has always loved being around the water, so joining Tasmania Police’s Dive Squad seemed like a natural progression. Fiona joined Tasmania Police in 1993 after seeing recruits running around the Academy on her regular journey to Clifton Beach Surf Life Saving Club. Fiona worked in the Drug Squad and Surveillance before joining Marine Services in 2005. She completed the Police Dive course later that year, becoming the first woman to join the Police Dive Squad. “I’d always been interested in water sports like swimming, water polo, surf lifesaving and scuba diving, so marine policing and dive squad were natural career progressions for me,” she said. “It’s not for everyone – we often work in water with low visibility and, because it’s Tassie, the water is very cold. We do a lot of work in dams, looking for either bodies, stolen items or weapons. “The upside of the Dive Squad was that you get to spend a lot of time working in a small team. The camaraderie is one of the things I miss about it now that I have moved on from Marine Services in Hobart. Fiona says she didn’t feel like she needed to overcome any barriers to join the Dive Squad. “I was fully accepted by my then Sergeant Paul Steane and everyone I worked for and alongside treated me as an equal,” she said. The disappearance of Burnie woman Helen Munnings in 2008 was one of the biggest jobs Fiona has worked on. And while Fiona misses being a current member of the Dive Squad since moving to King Island in 2013, she is enjoying her new post alongside her husband Sergeant Steve Shaw. Above: Constable Fiona Russell diving at Lake Kara as part of the Helen Munnings investigation (courtesy of The Examiner Newspaper). 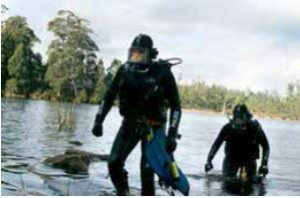 This page -- https://www.police.tas.gov.au/about-us/100-years-women-policing-tasmania-police/women-specialist-roles/diving-challenging-career/ -- was last published on February 13, 2018 by the Department of Police, Fire and Emergency Management.